Design Pressure (DP) testing measures the performance of fenestration products to withstand positive and negative pressures. To provide design pressure performance specifically attributed to door glass, Western Reflections doorglass frame and IG combinations were tested in fixed door slabs to isolate and focus all the design pressure against the doorglass assembly. Doorglass design pressure performance is typically superior to door system design pressure performance. 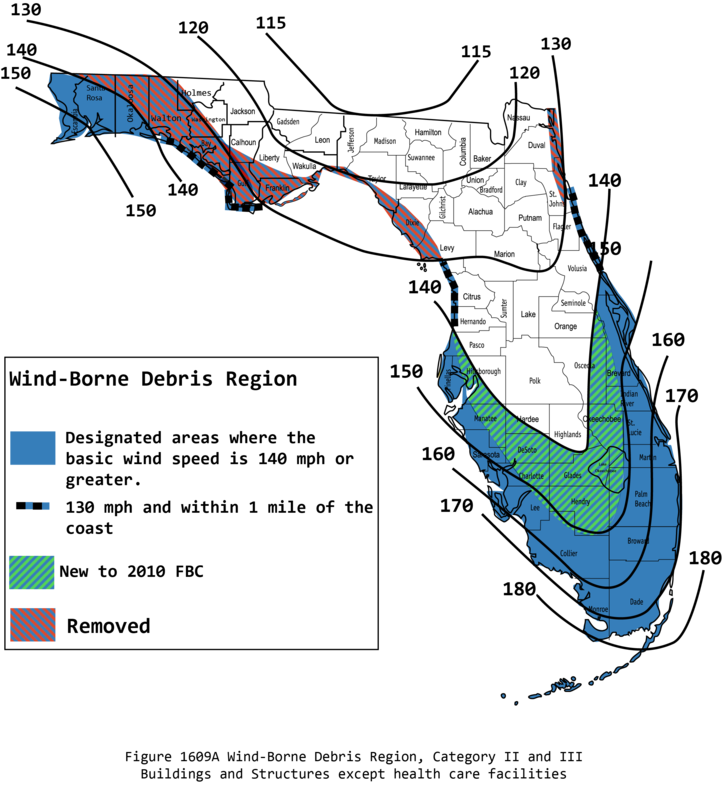 The 2017 Florida Building Code (FBC) has wind zone specific performance requirements for design pressure. Other states continue to adopt DP requirements. Design pressure requirements can vary based on product location on the building, height of the building, density of buildings, and wind zone designation. The positive DP number is the standard for wind blowing at the building (windward) and the negative DP number represents the vacuum pressure on the opposite side of the building (leeward). All Western Reflections doorglass products (decorative doorglass, clear doorglass, enclosed blinds) with FiberMate®, FiberPro®, SolarShield, and Severe Weather frames are certified to meet 2017 Florida Building Code (FBC) DP requirements in 1 and 2 story buildings. Non-impact door glass, depending on door slab and configuration, has DP ratings from ±45 to ±80. Specific DP ratings are included in Western Reflections' Florida Product Approvals for impact and non-impact doorglass products, found in product installation instructions. Visit the Florida Building Commission Product Approval website for Western Reflections' FBC Product Approval FL15260-R5 and FL 20335-R1 for specific model numbers and associated DP ratings for our non-impact units, and FL14935-R4 for our impact units. Transoms have a &plus;100/-110 rating for wood sills and &plus;100/-130 rating for composite trims for a rectangular shape; for curved shapes the rating is ±90, and for square shapes the rating is ±80/-130. Visit the Florida Building Commission Product Approval website for Western Reflections' FBC Product Approval FL4554-R5 for further details.